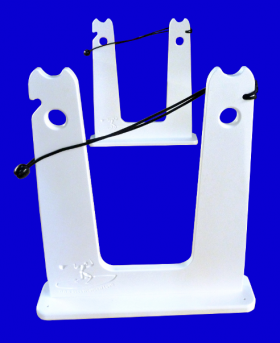 Touring & Racing Paddle Board Racks For Docks, Piers Or Any Level Surface. Free-standing storage racks for 1 or 2 paddle boards up to 7.5" thick. Easy installation on docks, piers or any other level surfaces, with or without fasteners. Maintenance-free King Starboard marine-grade plastic -- weatherproof & colorfast. SUP rack cutouts accept cable locks & chains for theft deterrence. Storage For Larger Stand Up Paddle Boards. Buck Woodcraft now offers racks that accommodate touring SUPs up to 7.5" thick, providing easy storage on your dock or anywhere else convenient to the water. These free-standing storage racks cradle touring SUPs securely off the ground or dock, yet require minimal lifting when stowing or unshipping your boards for a day on the water. We make our touring touring/racing SUP racks from 3/4" thick marine-grade King Starboard and assemble them with all stainless steelfittings -- and they stand up to fresh or salt water and sun better than just about any other material you'd care to name. That means they won't rot, warp, crack, rust or color-fade after years of exposure. Our touring SUP rack bases are pre-drilled at all 4 corners for easy mounting using the fasteners of your choice. If you're going to mount the racks on your dock, moderate size wood screws or small lag bolts will work just fine. You can also mount these stands on bare ground, using extra-long tent spikes to provide the necessary holding strength. You can also place them on an even surface (such as a garage floor) and they'll hold your SUPs pretty well with no mounting hardware at all. Fabricated using 3/4" thick King Starboard & stainless steel fasteners, our touring SUP paddleboard storage racks are sturdy and impervious to weather. Bungee tie-downs included for added security. Storage slots taper from 8-1/2" wide at the top to 7-1/2" at the bottom. 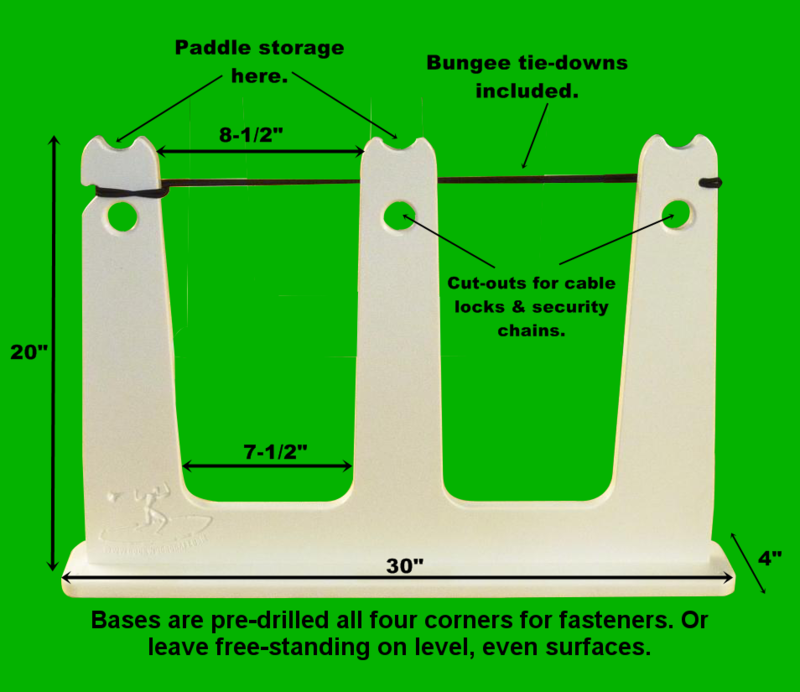 Rack bases are pre-drilled at the corners for fasteners of your choice. Very pleased with the product and service. I will use this company again. I am extremely happy with both the double sup dock holder and the wider, racing sup dock holder. My dock has never been so organized and the boards are very easy to get in and out of holders. I especially like that the paddles have a "home" on the holders.